Great choice for any electronic that requires this size battery. This model combines quality with a low cost that makes them one of the best deals in the battery world. Each CR2 battery packs the power of 3 Volts and a capacity of 750mAh for extra long run times in cameras, medical instruments and range finders. Thanks to their lithium chemistry, CR2s are great to purchase in bulk with an astonishing 10 Year Shelf Life. 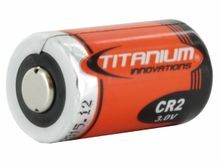 Caution: CR2 Lithium batteries are primary batteries and Not Rechargeable. Inserting a CR2 or any primary lithium battery into a charger may cause severe damage to both the battery and charger.